Most of us know that more stars in a hotel mean that it is a better hotel. However, there are no international standards to determine the star rankings of hotels. There are various rating systems which are designed and used by various government bodies, travel organizations, and travel websites. Nevertheless, most of these ratings are similar, despite a few small differences. 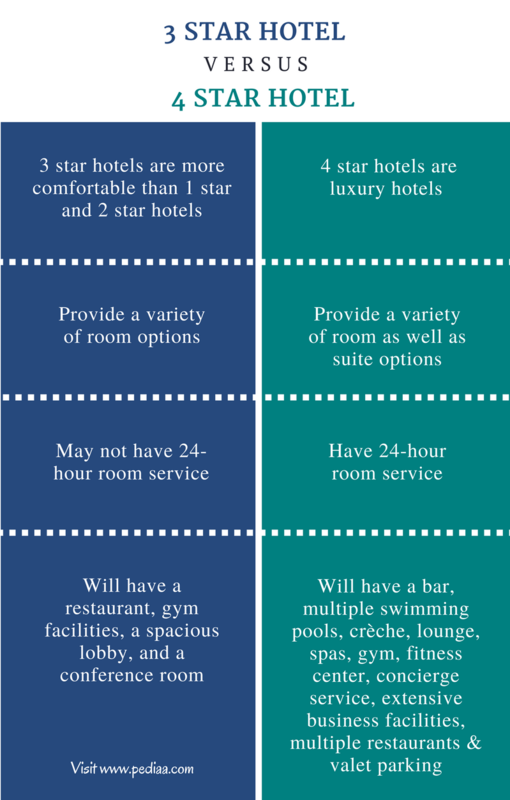 The main difference between 3 star and 4 star hotel is that 3 star hotels typically don’t have suites whereas 4 star hotels have both rooms and suites. 1. What is a 3 Star Hotel? 2. What is a 4 Star Hotel? 3. What is the difference between 3 Star and 4 Star Hotel? 3 star hotels are above average quality hotels. Comfort and service are a priority in these hotels. They are distinctly upgraded than 1 star and 2 star hotels and offer more spacious rooms with good quality amenities. They will also have multiple room options and variable room service. Most rooms will have more furniture such as couches, dressing tables, table, and chairs, etc. Many 3 star hotels have on-site restaurants, pools, fitness centers and well-designed lobbies. On-site medical assistance and valet parking can also be found in most of them. Some 3 star hotels also provide conference and meeting facilities for family get-togethers and business groups. The public places in 3 star hotels such as the lobby and dining area are more spacious. The garden or grounds of the hotel is well maintained and aesthetically pleasing. 4 star hotels offer more luxury than 3 star hotels and offer high-quality service and comfort. 4 star hotels are stylish and sophisticated and are known for their upscale accommodations. They also provide fine dining, bars, swimming pools, lounges, spas, gyms, fitness centers, concierge services, extensive business facilities, multiple restaurants and valet parking. 4 star hotels will have more room options than 3 star hotels since they also offer suites. All rooms and public areas will have Wi-Fi or another internet connection. 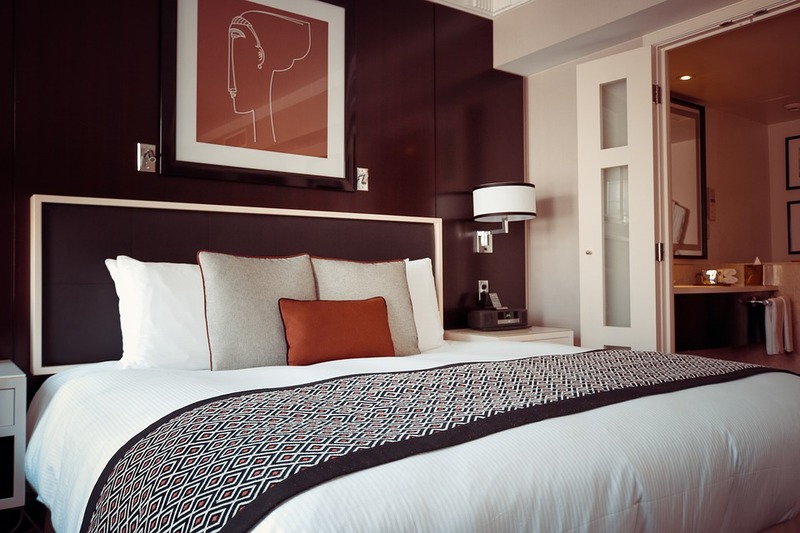 They will also have superior bedding, linen, and extensive amenities and have 24-hour room service. The staff will provide an excellent service and have careful attention to detail. Comfort and convenience of the guests are the main concerns of the guest. 3 star hotels are more comfortable than 1 star and 2 star hotels. 4 star hotels are luxury hotels. 3 star hotels provide a variety of room options. 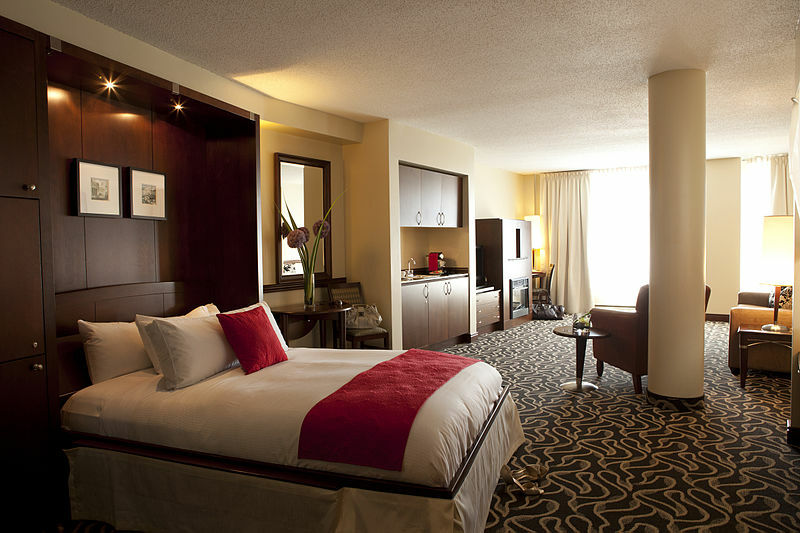 4 star hotels provide a variety of room as well as suite options. 3 star hotels may not have 24-hour room service. 4 star hotels have 24-hour room service. 3 star hotel will have a restaurant, gym facilities, a spacious lobby, and a conference room. 4 star hotel will have a bar, multiple swimming pools, crèche, lounge, spas, gym, fitness center, concierge service, extensive business facilities, multiple restaurants and valet parking.